Claiborne wants it clear that he didn’t leave because he was demoted. He says he left because of how the news was presented to him. It made him so angry that he had to leave before the situation escalated. Claiborne said he went to call his mother and got by himself to collect his thoughts and pray. He also fielded several calls from supportive teammates concerned about his whereabouts. Once he cooled off, Claiborne returned to the Cowboys facility and met with coach Jason Garrett to expresses his regrets. 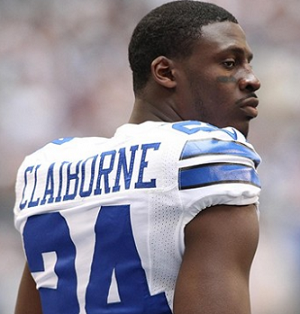 Claiborne won’t start in this Sunday’s game against the Saints, but he is expected to see the field a lot. The Saints run a lot of multi-receiver sets in which extra DBs will be needed for the Cowboys in a game that should be a shootout. Of course, everybody around the Cowboys says the issue is settled and it won’t be a distraction. But that’s what they would say to the media even if it was a distraction. Personally, I don’t think it’s that big of a deal. More than half of the players on every pro and college football team — including whichever team you think is the most copacetic in the world — are some kind of bitter about not being a starter. Every backup wants to start and play more. As a team, you just deal with it and hope everyone comes to accept their role. After an initial outburst, Claiborne is doing that now. As petty as his behavior appeared, it would be just as petty to hold it over his head for more than a few days. And if you can understand his background, you can understand his frustration. Claiborne was a three-star recruit out of high school who not only became the best defensive back at the DB factory that is LSU, he was arguably the best DB in college football. He was the No. 6 overall pick in the 2012 NFL Draft and was thrown right into the fire as a starter for the most scrutinized team in the league. He came back from a serious shoulder injury in his second pro season to eventually reclaim that starting spot, and then he loses it again. Would you take that with a Coke and a smile? Set aside your feelings about the money and the glamour and the privileges of being a pro athlete and you can admit you’d be upset too if you were Claiborne. You’ve probably even had a similar meltdown, either at work or at school or at home. The difference was that nobody was waiting to write about yours and put it all over the Internet, in newspapers and on TV.